All Season & Hank Parker's Party & Tent Rental is South Florida's premier choice for party rentals for your weddings, corporate events and other celebrations. 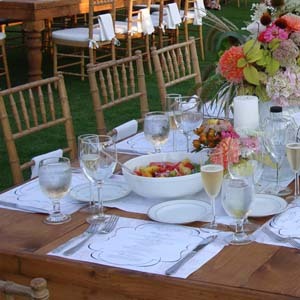 We offer an extensive selection of tents, tables, chairs, linens and more - perfect for any occasion. Our expansive inventory is second to none in the state of Florida. We keep our finger on the pulse of event trends and are committed to making your special event the most memorable experience possible. All Season & Hank Parker's Party & Tent Rental has tents, tables, chairs, fine china, flatware, specialty linens, centerpieces, tents, flooring, lightening and more for events ranging from an intimate cocktail party to a large fundraising gala. Whatever your occasion, style or theme, we have a classy and stylish solution for you. WEDDING & EVENT RENTALS FOR SOUTH FLORIDA AND BEYOND! Operating out of Western New York locations in Rochester & Buffalo, as well as our Central New York location in Syracuse, All Season & Hank Parker's Party & Tent Rental is the ideal partner for all your event planning and party rental needs in the state of Florida as well. No matter if you are planning your event in Florida or anywhere else, we can make your vision come to life with an extensive product inventory. SELECTION AND SERVICE SET US APART! All Season & Hank Parker's Party & Tent Rental is a full-service party rental business that built a reputation for top-notch customer service, superior products and innovative ideas. We add a unique element to any event. With more than four decades of experience, this family owned and operated business can help you customize a distinguished look for your wedding, corporate event or special occasion. Professional Rental Consultation: Our knowledgeable consultants are available to help you choose the items you need. They will help you navigate through the countless choices we have available for rent to perfectly highlight your occasion. Site Assessment: We gladly check out your venue to make sure you have the right equipment for a problem-free event. Delivery and Pickup Services: Our trained staff will make sure that we deliver on schedule, every time. Rental Equipment Support: Our staff is happy to provide clear and concise instruction on how to use our rental equipment. Visit a showroom: Our showrooms in New York, including locations in Buffalo, Rochester and Syracuse, have samples of many rental items and we will gladly help you choose. As a full-service, party rental company we can make your events truly memorable in any setting or venue. Our dedicated staff works around the clock to make sure that every event consistently receives the best customer service. Let's start planning your Florida event! Call us toll-free at 866.604.2629 or use the Contact Us form below!